Why is it that one person can happily make it through the day without a droplet of sweat appearing, while another walks to the subway and is so soaked it looks like she ran the Boston Marathon before diving into Niagara Falls? Well, here's the hard science of it: some people sweat more than others. Shocking, yes. Factors like gender (men produce more sweat than women) and disparities in physiology and genetics play a role, and it's obviously normal to be dripping in 95-degree heat or while exercising -- that's how the autonomic nervous system reacts to high temperatures and physical exertion. But profusely perspiring like a wildebeest at your desk is uncomfortable, unhealthy, and embarrassing; it makes social, romantic, and professional situations even more stressful, which is a vicious cycle because anxiety makes you sweat. Here's why it happens, and what you can do about it. Your issue could also be stemming from hyperhidrosis, a condition that affects roughly 3% of the population and causes excess sweating in the hands, feet, face, and armpits. "The exact physiologic mechanism of hyperhidrosis is not fully understood," explains Dr. Christopher Carrubba, co-director of tutor development at Med School Tutors, "but many researchers believe that it is related to an overactive sympathetic nervous system. It can also be tied to many serious medical conditions including hyperthyroidism, diabetes, heart attacks, and infections like malaria or tuberculosis." Hyperhidrosis can occur "with or without the presence of an offensive odour," so if you're in the former group you may be particularly desperate. Since an underlying condition may be to blame (otherwise known as secondary hyperhidrosis), it's important to see a doctor if you notice you're dripping way more sweat than usual. Having to change shirts after a Thai dinner could indicate diabetes, for example, though you'll probably need a battery of tests to pinpoint the problem. Otherwise, here are some other ways to keep your cool and combat misty polo shirts. Client presentations, first dates, the starting line at the Running of the Bulls -- put yourself in one of these high-stress situations and it's likely your hands will get clammy and beads of sweat will form on your brow. This is your body reacting to anxiety-inducing scenarios by shooting out hormones and adrenaline, kicking your body into "fight or flight," mode and stimulating your sweat glands. Next time you're feeling nervous, calm your nerves with some controlled breathing. Sit down with your arms at your sides and taking a deep, slow breath in through your nose; hold it for three seconds, then exhale through your mouth for seven seconds. Repeat this 10 times. A few extra pounds could be putting your body in overdrive and causing you to sweat like whoa. "Overweight and obese people perspire more than those with a normal weight," explains Dr. Alexandra Sowa, internist at Weill Cornell Medicine and New York-Presbyterian. "Fat is an insulator that alters the body's perception of how much sweat is needed for adequate temperature control. Thus, more fat causes an increased sweat production." Fortunately, sweating in excess is encouraged at the gym. If your perspiration threshold is lower than average, it's in your best interest to put down the Tabasco sauce and walk away. Eating spicy foods sends chemical signals to your brain that the heat you've consumed is similar to other types of warmth. Then the next thing you know, your tortilla chips arrive with a side of pit stains and your date is fighting a lose-lose olfactory battle. One upside to passing on the salsa? Springing for the mild side of guac -- even if it costs extra -- because you basically don't have a choice. Look, I'm sure you look great in that neon spandex bodysuit. But in addition to showing off your #squatgoals, it's literally suffocating you. "Wear natural fibers like cotton to let your skin breathe," suggests Sowa. "Also, avoid synthetic fibers which don't allow for airflow, making you hotter and sweatier." If you struggle with extreme sweating, that drugstore-brand deodorant in a Tropical Breeze Twist scent isn't going to cut it. Arm your pits with something more heavy duty -- meaning, a prescription antiperspirant with a higher dose of metal salt to physically obstruct the opening of sweat gland ducts. "For excess sweating, I prescribe Drysol, an aluminum chloride 20% topical solution, to be applied nightly for one week and washed off in the morning," says Dr. Barbara Alpert of Mount Kisco Medical Group in Mount Kisco, NY. "For maintenance, continue to apply once or twice a week." Seek medical intervention -- including Botox and lasers! If your excessive perspiration is diagnosed as hyperhidrosis, your doctor may prescribe medical treatment based on your condition's severity, from oral medication to Botox, lasers, or miraDry (microwave energy). As a last resort, surgery is also an option to interrupt the sympathetic nerves that cause sweating, though this irreversible route is rarely used since it can lead to complications way worse than a damp shirt. 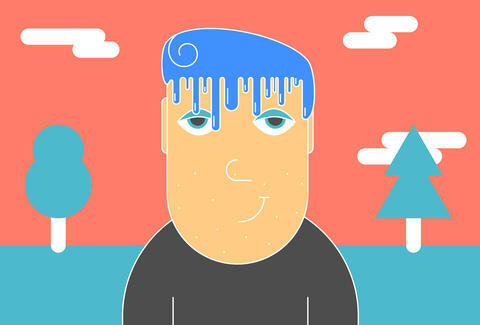 Sweat can be embarrassing, especially if there's an unpleasant odor that comes with it. At the end of the sweaty day, perspiration for those without hyperhidrosis is a natural human function that probably shouldn't ratchet up your stress levels too much. After all, that stress is just going to make you sweat more. Brooke Sager is an NYC-based contributing writer for Thrillist who is in a long-term relationship with her window-unit air conditioner. Don't hug her after the gym, but do follow her on Instagram and Twitter @HIHEELZbrooke.